Christmas Christmas is the largest celebration of the year. It starts on the 24 th of December and finishes on the 6 th of January. It is the celebration. 1 Christmas Christmas is the largest celebration of the year. It starts on the 24 th of December and finishes on the 6 th of January. It is the celebration of the birth of Jesus, in the manger in Bethlehem. 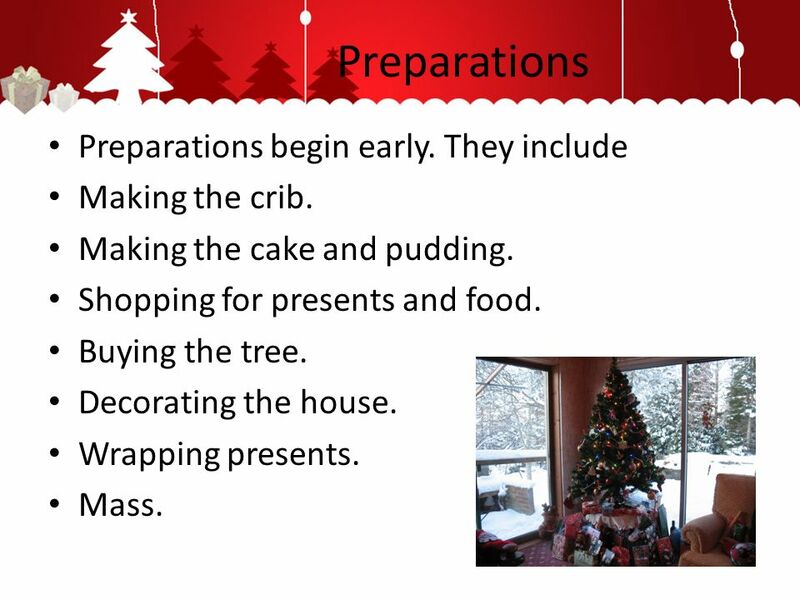 2 Preparations Preparations begin early. They include Making the crib. Making the cake and pudding. Shopping for presents and food. Buying the tree. Decorating the house. Wrapping presents. Mass. 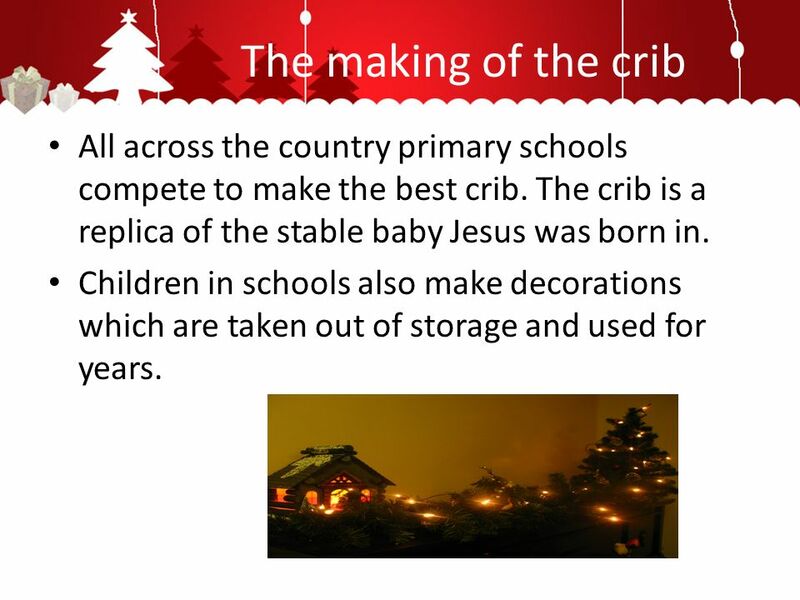 3 The making of the crib All across the country primary schools compete to make the best crib. The crib is a replica of the stable baby Jesus was born in. Children in schools also make decorations which are taken out of storage and used for years. 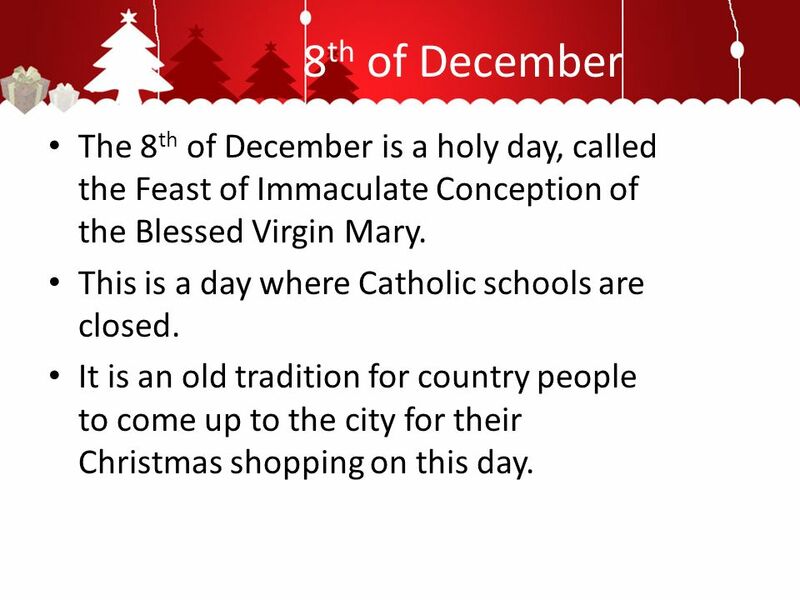 4 8 th of December The 8 th of December is a holy day, called the Feast of Immaculate Conception of the Blessed Virgin Mary. This is a day where Catholic schools are closed. It is an old tradition for country people to come up to the city for their Christmas shopping on this day. 5 Decorations Shops, streets and homes are decorated for Christmas. 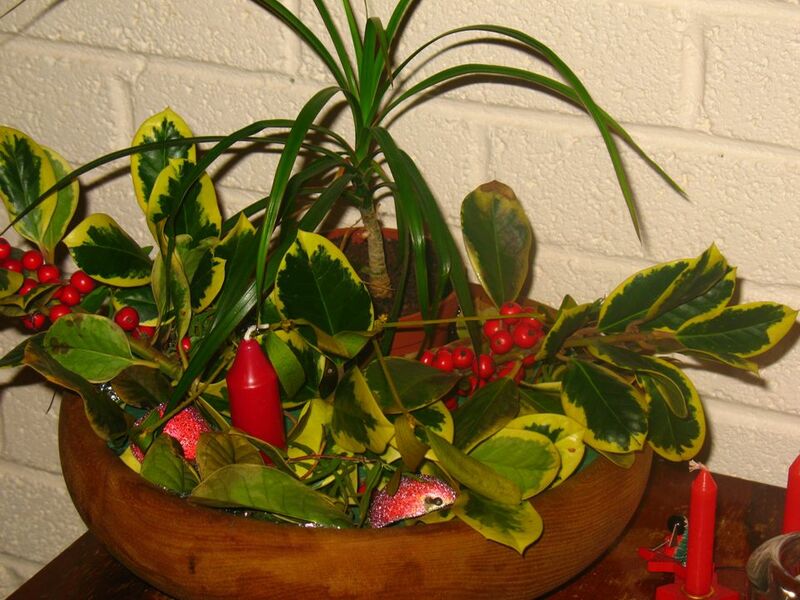 Decorations are traditionally holly and ivy which people gathered in the woods. People often cut down their own Christmas tree also. Now Christmas lights, ornaments and candles are frequently used. 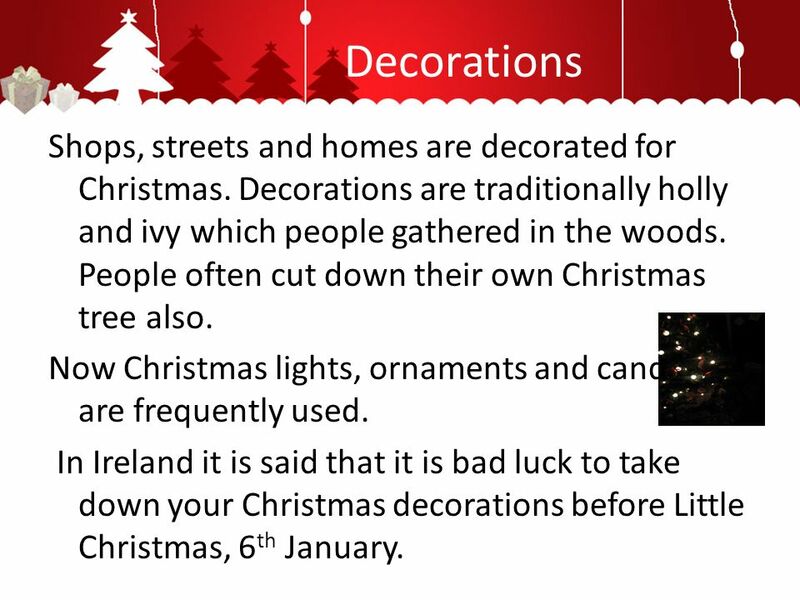 In Ireland it is said that it is bad luck to take down your Christmas decorations before Little Christmas, 6 th January. 7 The mistletoe This is a plant called the mistletoe that people hang off their lights and if you are unfortunate enough to be under it you must share a kiss with the other person under it. 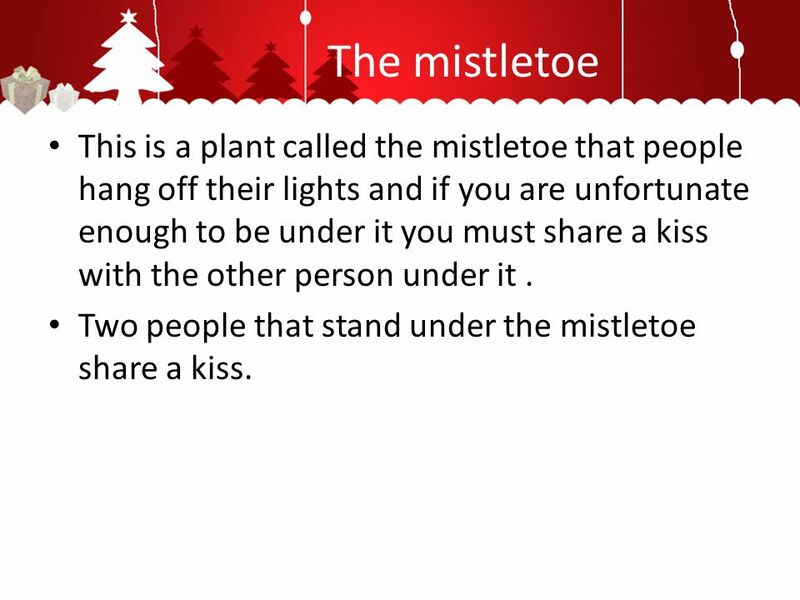 Two people that stand under the mistletoe share a kiss. 8 Irish Christmas pudding The Christmas pudding must be prepared months before Christmas. 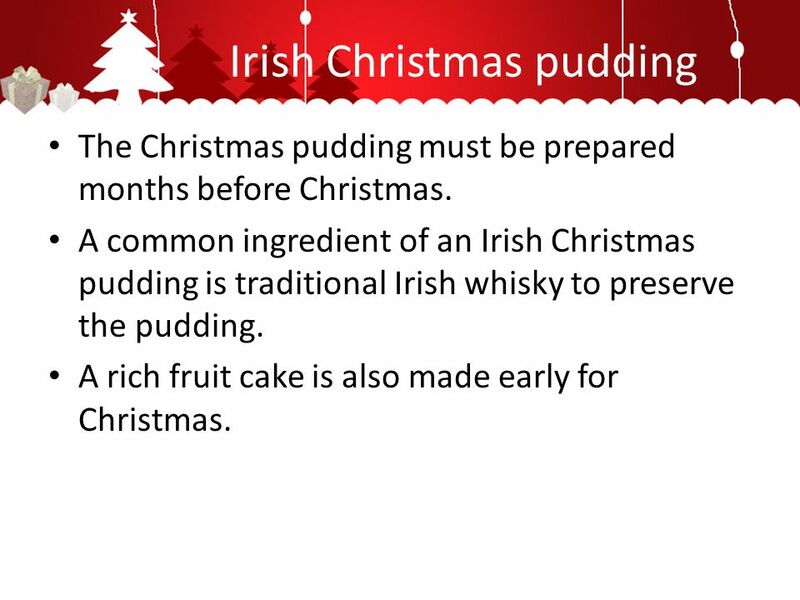 A common ingredient of an Irish Christmas pudding is traditional Irish whisky to preserve the pudding. A rich fruit cake is also made early for Christmas. 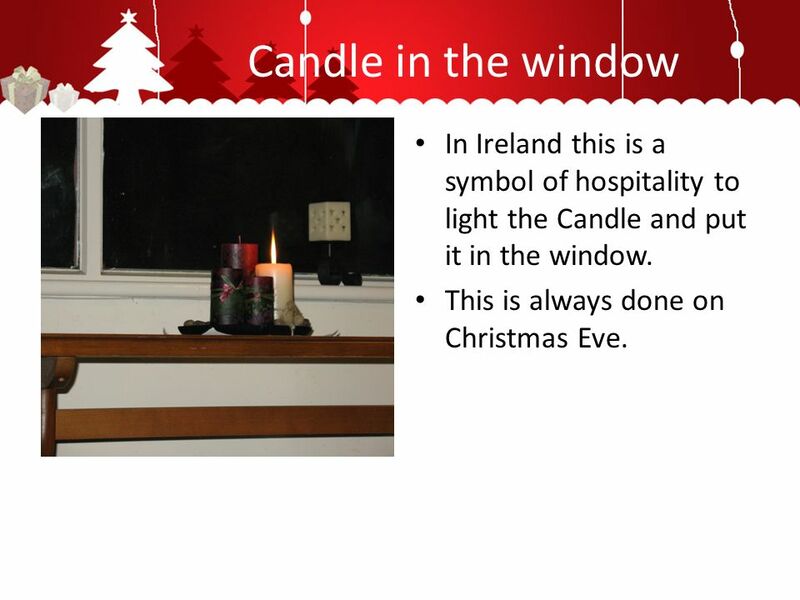 9 Candle in the window In Ireland this is a symbol of hospitality to light the Candle and put it in the window. This is always done on Christmas Eve. 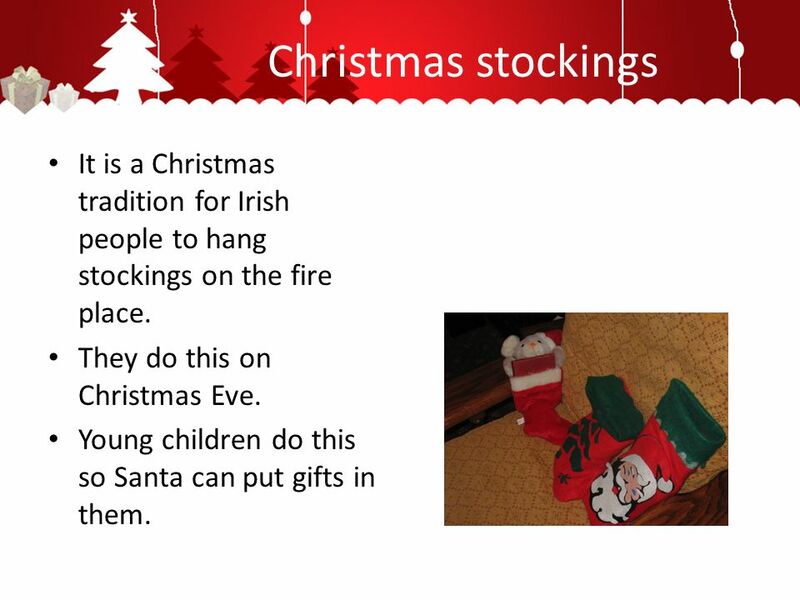 10 Christmas stockings It is a Christmas tradition for Irish people to hang stockings on the fire place. They do this on Christmas Eve. Young children do this so Santa can put gifts in them. 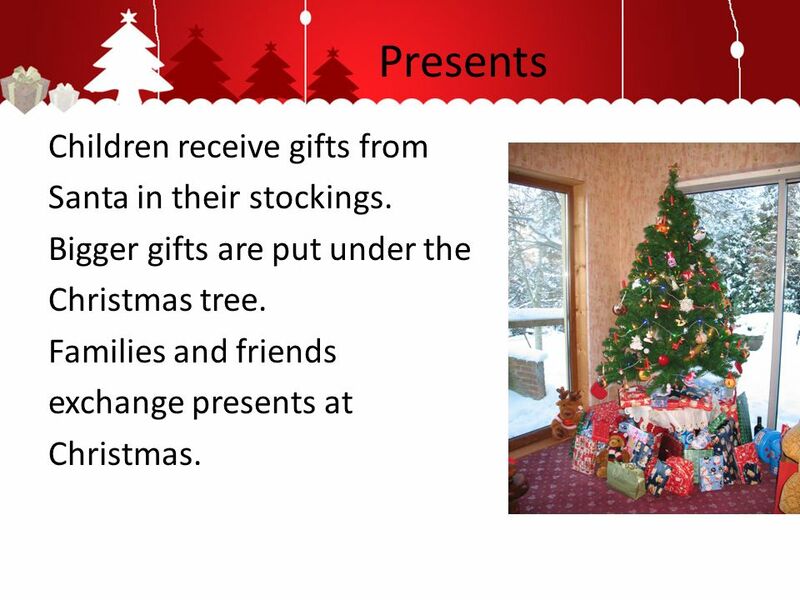 11 Presents Children receive gifts from Santa in their stockings. Bigger gifts are put under the Christmas tree. Families and friends exchange presents at Christmas. 12 Coal for Christmas Irish children are told by their parents that they will get a sack of black coal for Christmas if they are not good. 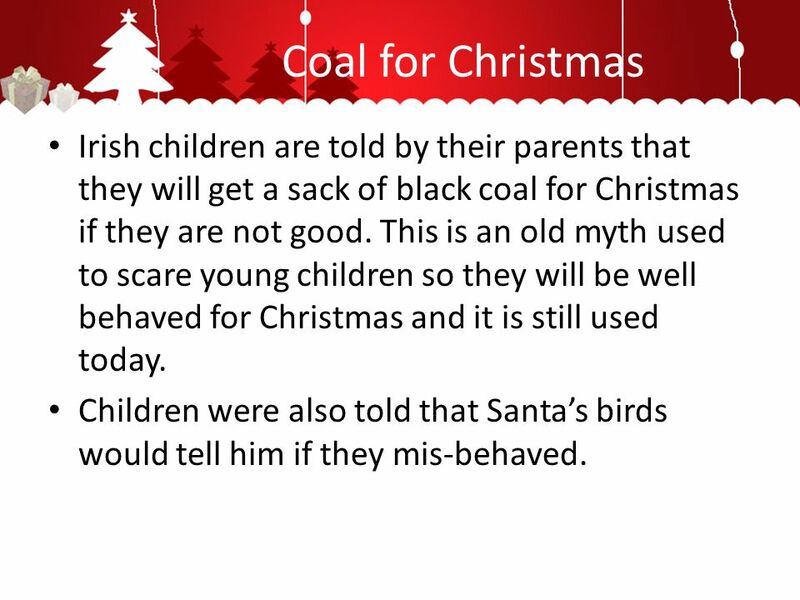 This is an old myth used to scare young children so they will be well behaved for Christmas and it is still used today. Children were also told that Santas birds would tell him if they mis-behaved. 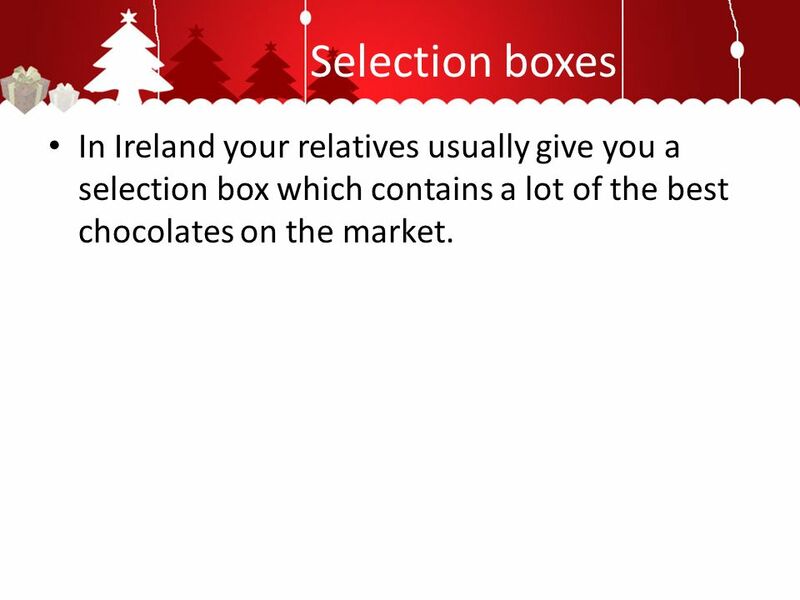 13 Selection boxes In Ireland your relatives usually give you a selection box which contains a lot of the best chocolates on the market. 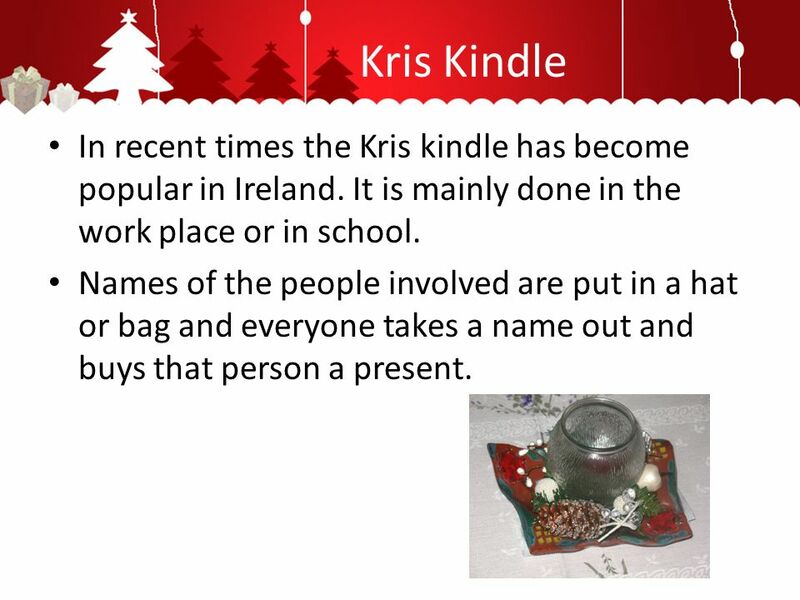 14 Kris Kindle In recent times the Kris kindle has become popular in Ireland. It is mainly done in the work place or in school. Names of the people involved are put in a hat or bag and everyone takes a name out and buys that person a present. 15 Christmas mass This is the busiest day for the Catholic church as it is a typical Irish tradition to go to church on the night of Christmas Eve. This is called midnight mass. 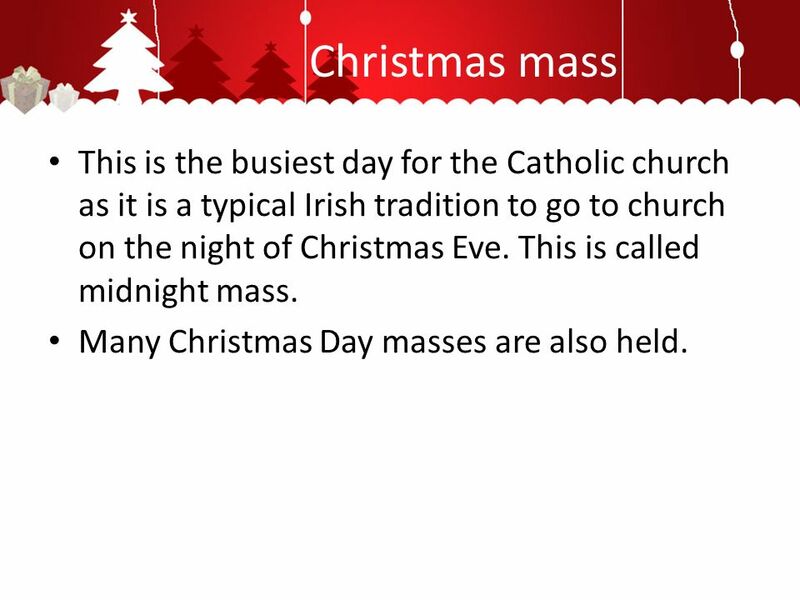 Many Christmas Day masses are also held. 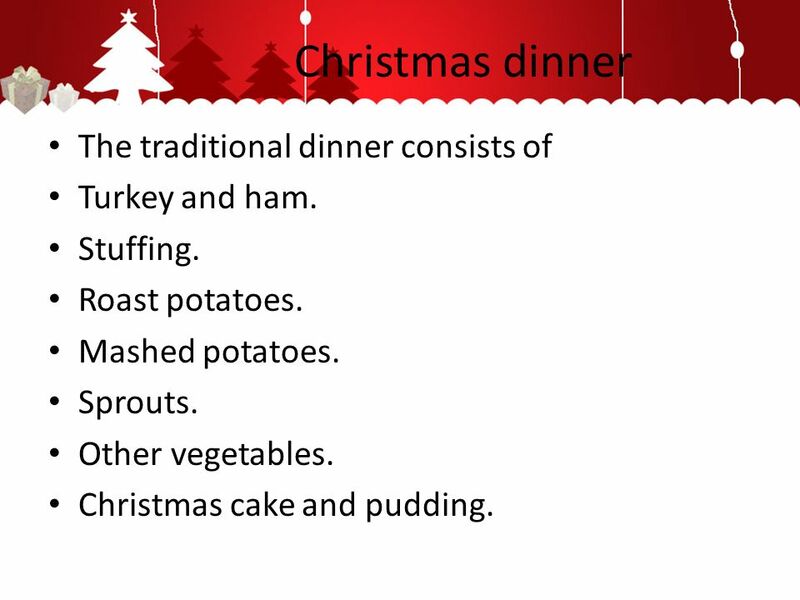 16 Christmas dinner The traditional dinner consists of Turkey and ham. Stuffing. Roast potatoes. Mashed potatoes. Sprouts. Other vegetables. Christmas cake and pudding. 17 Procession of the wren This takes place on St. Stevens Day, the day after Christmas Day. 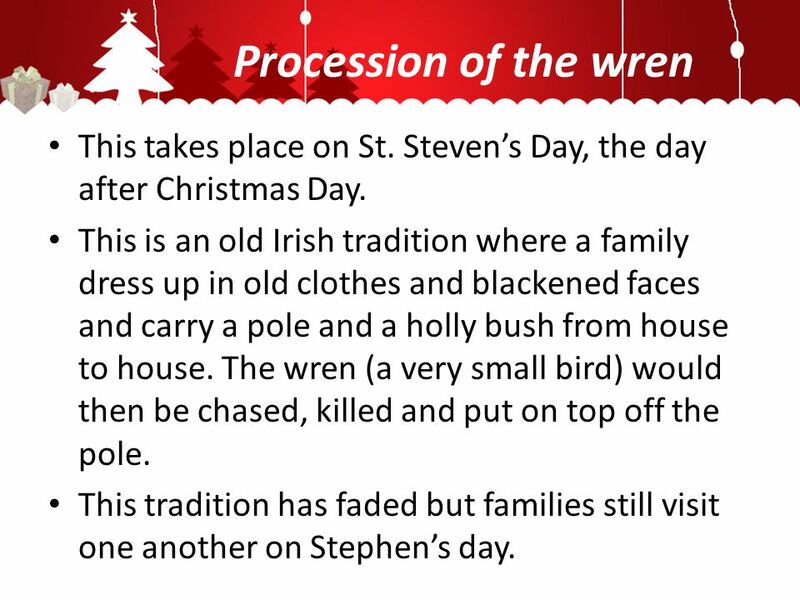 This is an old Irish tradition where a family dress up in old clothes and blackened faces and carry a pole and a holly bush from house to house. The wren (a very small bird) would then be chased, killed and put on top off the pole. This tradition has faded but families still visit one another on Stephens day. 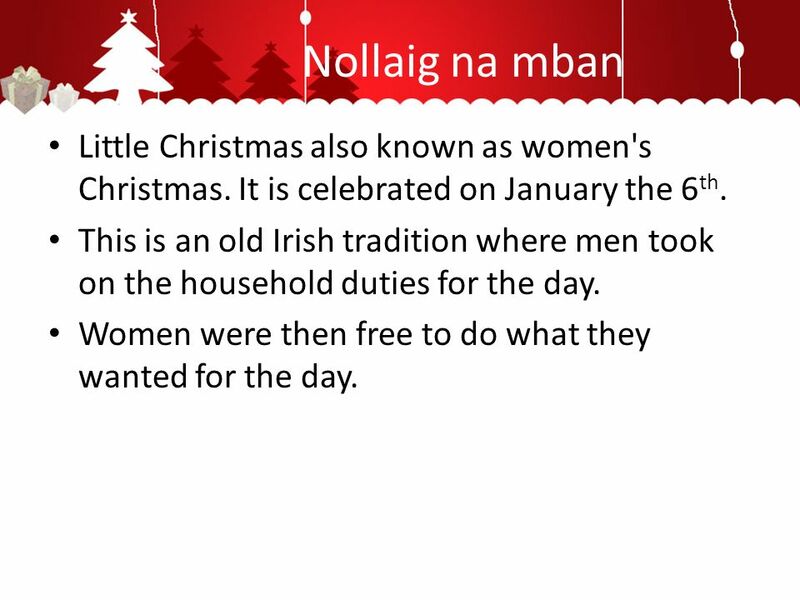 18 Nollaig na mban Little Christmas also known as women's Christmas. It is celebrated on January the 6 th. This is an old Irish tradition where men took on the household duties for the day. Women were then free to do what they wanted for the day. 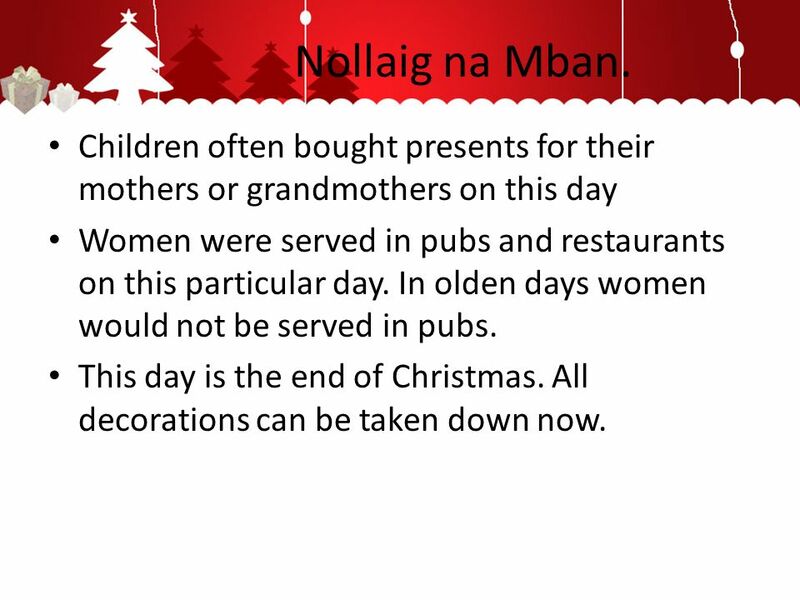 19 Nollaig na Mban. Children often bought presents for their mothers or grandmothers on this day Women were served in pubs and restaurants on this particular day. In olden days women would not be served in pubs. This day is the end of Christmas. All decorations can be taken down now. 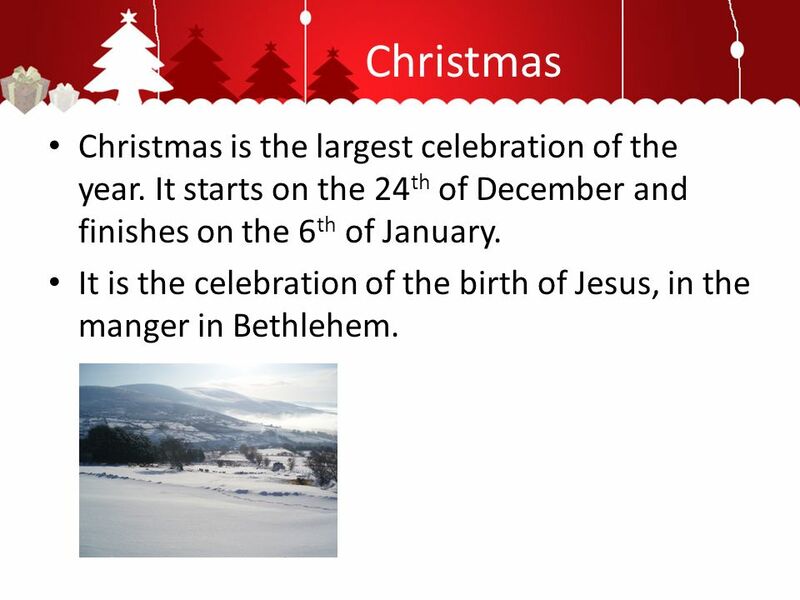 Download ppt "Christmas Christmas is the largest celebration of the year. It starts on the 24 th of December and finishes on the 6 th of January. It is the celebration." Christmas Celebration Hi, People! Do you want to know how we celebrate Christmas in Portugal?  In Poland, Christmas is officially known as Boze Narodzenie, though it is most often referred to as Gwiazdka, meaning "little star." Christmas Eve in. Ireland's Christmas Ireland's Christmas is more religious than a time of fun. Irish women bake a seed cake for each person in the house. They also make. In Slovakia, Christmas celebrations begin with Advent. Many Slovaks are Roman Catholics so this is the start of the important spiritual preparations for. How do the British celebrate Xmas? Authors: Marta Konik and Kamila Marcinowska Class 3D. Christmas in Australia. Christmas Day falls in the middle of the summer school holidays and both December 25 and 26 are public holidays. Many people celebrate. CHRISTMAS in America. The History of Christmas Christmas was celebrated all over Europe as early as the 1300s. Christmas in the United States Come along and uncover American Christmas celebrations, and the precious traditions of this culture. Holiday Customs Around the World. United States Christmas traditions vary greatly across the country. Children wait for Santa Claus to bring them presents. Christmas and New years. Christmas  Christmas is celebrated on December 25  Christmas is a Christian holiday but many people who are not Christian also. Why do people celebrate Christmas? To celebrate the birth of Jesus Christ.